CityServiceBike is a brand new initiative by Elza van Genderen. Inspired by her knowledge that every day maintenance and installation businesses encounter obstacles while working in the city centre, she launched a pilot on 11 May in Utrecht, which will provide a solution for businesses who want their workers to instead travel by bicycle. What is the problem, though? The centre of Utrecht is not a friendly place for drivers of vans. One-way traffic often means drivers must take long, circuitous routes around blocks in order to reach a destination which is very close. Then there is the challenge of finding a parking space and the quickly mounting expense of parking for a few hours. Working in this way is frustrating and inefficient in terms of time and money. Not to mention that the very presence of these vehicles in city centres bring many negative impacts in terms of air pollution, road danger and competition for space. CityServiceBike proposes a solution for this. The initiative facilitates van parking space on the outskirts of the city. Here, maintenance and installation businesses can park their vehicles and transfer their materials to an electric cargo bike that is ready to be used to visit their customers. 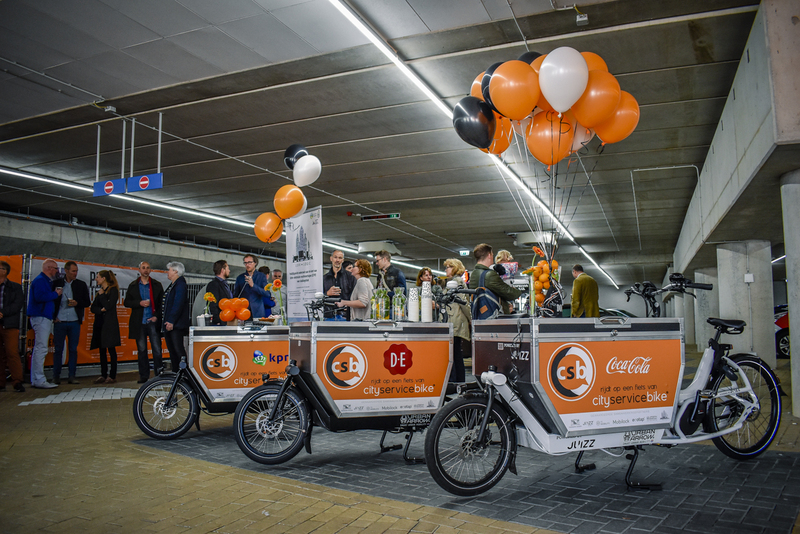 Three partners, KPN, Coca-Cola and Douwe Egberts are participating in the three-month trial and for now the service is open only to these three organisations. The trial is being facilitated by the LEVV-LOGIC project as a Living Lab. This means that the hypothesis that by switching to the bicycle, businesses can serve their customers in a faster, more efficient and enjoyable way, will be tested. 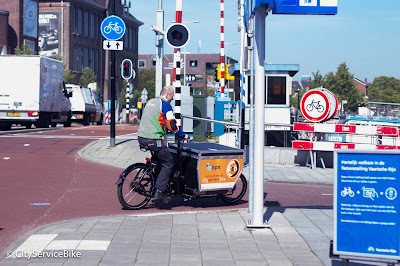 Assuming that is the outcome, CityServiceBike hope to open the service to other businesses and eventually implement the initiative commercially throughout the Netherlands. @copyright ICBF. Simple theme. Powered by Blogger.